Scott Kelly has officially broken the record for the more time spent in space by any American, reaching 383 days today and beating NASA's Mike Fincke's record of 382 days. This is Kelly fourth mission into space, charged with spending a year on the International Space Station to test the effects of space and space travel on the human mind and body in preparation for NASA's Journey to Mars mission, which it fully unveiled just last week. He arrived on the ISS with fellow Russian cosmonaut Mikhail Kornienko earlier this year, and both "and participating in studies during their 342 days in space that provide new insights into how the human body adjusts to weightlessness, isolation, radiation and stress of long-duration spaceflight," according to NASA. Kelly's identical twin brother, Mark Kelly. who is also an astronaut, is also participating in a parallel study on Earth so that scientists can compare the effects of space on the body and mind. "The investigations in progress on the space station will help scientists better understand how to protect astronauts as they travel into deep space and eventually on missions to the Red Planet," NASA explained. Kelly, who is 51 years old, is only just over half way done with his mission, and is scheduled to come back to Earth on March 3, 2016, taking his total time spent in space up to 522 days. Of course, that is still short of the world record, which is currently held by Russian cosmonaut Gennady Padalka, who has spent 879 days in space over five separate trips. But NASA does say that in about two weeks, on October 29, Kelly will break another record, as he will have spent 216 consecutive days in space as part of his one-year mission, breaking astronaut Michael Lopez-Alegria's record for longest single spaceflight by a US astronaut. 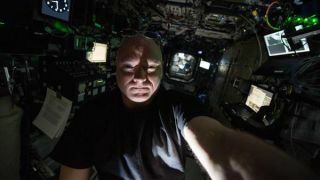 "Kelly, Padalka and the more than 200 people who have visited the space station are contributing to the development of capabilities to enable a sustainable human presence in deep space," NASA said. Check out a video of Scott Kelly's year in space so far, below.